With beautiful scenes connected through shades of fuchsia and violet, reflecting the femininity of the characters, this gentle film follows the development of love between two young women. Set against the backdrop of the bustling streets of Nairobi, the two very different girls must choose between love and safety surrounded by insular gossip, local politics and burgeoning maturity. Their magnetic pull draws us into a queer Romeo and Juliet romance, as they try to hide their relationship from their politically opposing fathers. 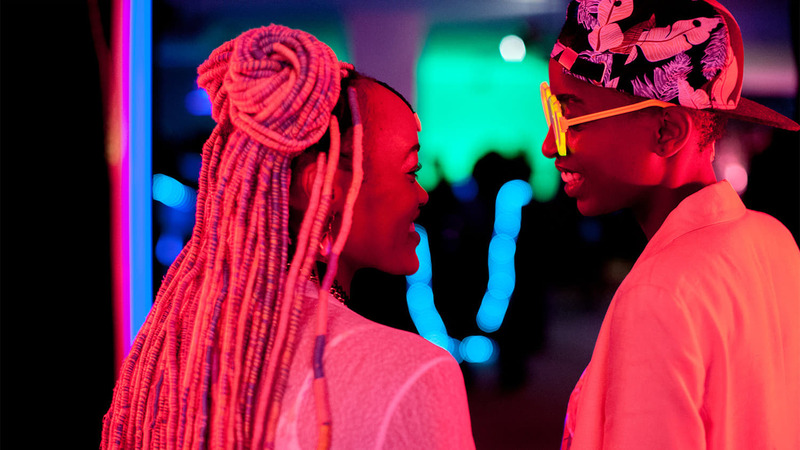 Directed by Wanuri Kahiu, part of a strong cohort of Kenyan female filmmakers, Rafiki was the first Kenyan film to be included in the Un Certain Regard section in Cannes earlier this year, and was then controversially banned from being shown in Kenya by the Kenya Film Classification Board. Please fill in the below. You will receive a confirmation email shortly containing information regarding your request. Do you require a copy of the film? Additional comments/requests e.g. Required format.